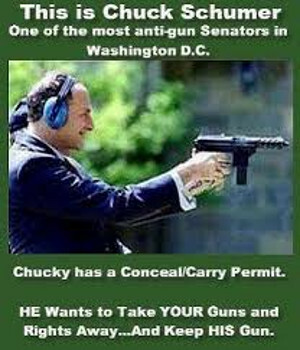 Schumer is encouraging federal agencies to require that bidding manufacturers only sell firearms to the civilian market through dealers that do not transfer a firearm where (in his words) there has not been a “completed” background check. Of course, all gun dealers are already required to conduct a NICS check prior to transferring any firearm. However, if the FBI delays a transfer for further research into a transferee’s background, but after three days is unable to determine whether the person is eligible to possess firearms, the dealer may transfer the firearm. This is an important safety-valve that restricts the federal government from arbitrarily barring individuals from acquiring firearms by delaying them in perpetuity. In the rare case that a firearm is transferred to an individual after the safety-valve period and they are later found to be prohibited, ATF routinely sends people out to retrieve the firearm. Hat tip: BadBlue Real-Time Gun News.